The Faculty and Staff for Justice in Palestine organization at the University of Massachusetts Boston (FSJP-UMB) joins our colleagues at the University of Massachusetts Amherst in congratulating their Graduate Employee Organization (GEO/UAW Local 2322) for its adoption of a resolution to join the international Boycott, Divestment, and Sanctions movement (BDS) against Israel. The resolution calls on the graduate students’ employer and their union to divest from and boycott companies that fuel and profit from Israel’s military occupation and repression of Palestinians. The largest collective bargaining unit within UAW Local Amalgamated 2322 (UAW 2322), GEO represents over 2,000 graduate student workers at the flagship campus of the University of Massachusetts. This makes GEO the second major body of unionized workers in the U.S. to formally join the BDS movement by membership vote, after the 2015 vote of the graduate student workers at the University of California. FSJP-UMB rejects the claim that the resolution is in any way discriminatory. Rather, we agree with GEO workers that it is an expression of the profound truth that all struggles for freedom are linked. Workers’ rights are intertwined with Palestinians’ rights, and liberation for some is incomplete without the liberation of all. Palestinian students and faculty members are denied the basic academic freedoms of the right to travel and to be safe from military attacks on their own campuses. As educators and staff committed to equal access to all forms of knowledge production, we stand against all forms of colonialism, racism, and apartheid. These hierarchical forms of power relations make free intellectual inquiry impossible. As educators and workers, FSJP-UMB stands in proud solidarity with UMass Amherst GEO. 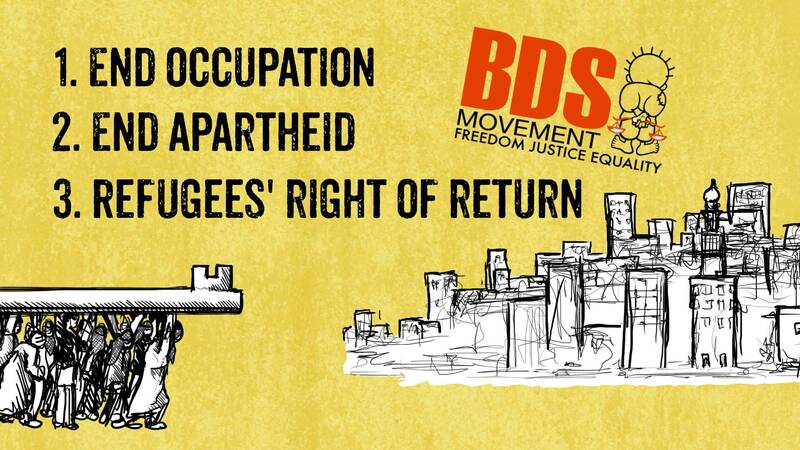 BDS is a global grassroots movement, called for by Palestiniancivil society and major trade unions, to engage in non-violent, civil society pressure on the Israeli state until it ends its illegal occupation of Palestine and dismantles the Wall, grants equal rights to Palestinian citizens of Israel, and upholds Palestinian refugees’ right of return. We will persist in this struggle until these goals are met and Palestinians and workers everywhere achieve justice and freedom. This entry was posted in BDS, U.S. Labor News, UAW 2322 (GEO), UMass-Boston and tagged UMass-Boston. Bookmark the permalink.